Acclaimed strategist and best-selling author Ralph Peters examines America’s Civil War. Part 1 of 3 includes the skill & endurance of Johnny Reb, the meaning of the Confederate battle flag, and a comparison of Lincoln & Davis. 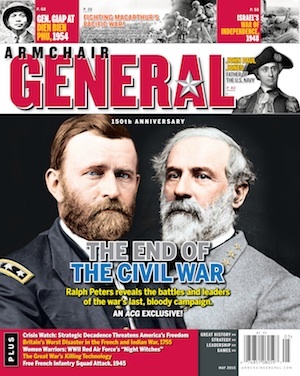 The May 2015 issue of Armchair General magazine features an article by Ralph Peters on the desperate situation Robert E. Lee faced in the final days of the Civil War - plus articles on WWI, the Pacific War, French and Indian War and more. The latest version of Uncommon Valor - Real Heroes recognizes Army Staff Sgt. Jeffrey M. Dawson, Army Sgt. Bryan C. Anderson, Air Force Master Ivan Ruiz and Navy Seabee diver Robert D. Stethem.